President Uhuru Kenyatta and Raila Amolo Odinga’s encounter at the funeral service of the late Njoroge Mungai was not a random or unplanned event. A great deal of networking on both sides had gone into the works, resulting in the dramatic face to face encounter as strictest protocol norms were agreed well in advance far behind tightly closed doors in the corridors of power as a number of elites came into play. Protocol number one was the seating arrangements in the VIP section at the PCEA Church of the Torch at Thogoto, Kikuyu, Kiambu county. Raila would not be seated next to Uhuru and First Lady Margaret but between former First Lady Mama Ngina Kenyatta and former President Mwai Kibaki. The two seats of VIPs were separated by a red-carpeted aisle. Protocol number two was that Raila would not talk politics. Also planned far in advance were the president’s own words and the flavour of his remarks. Kenyatta told Raila that he was ready to work with him. Analysts instantly interpreted this to mean that it was extending an olive branch and reaching out to Raila to broker peace. But Raila, who spoke before the president, made history for the first time in his life by not talking politics when given the chance to speak at the funeral service. Instead, he gave Mungai what appeared to be a heartfelt eulogy. Raila’s praises of one of the founding powerbrokers of modern Kenya, a man who played the power game with ruthlessness, cunning and divide-and-rule schemes stunned many Kenyans. Mungai was one of the founding Vice President Jaramogi Oginga Odinga’s biggest political enemies and one of the three principals tasked to frustrate the elder Odinga’s political wing – the Kenya People’s Union – the country’s first post-independence political party between 1966, when it was founded, and 1969, when it was proscribed. But Raila eulogised Mungai as a giant of the independence struggle, champion of education for Kenyans and post-independence entrepreneurship. 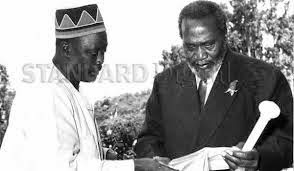 These were the amazing scenes to those who could remember the huge struggle between Mungai and Kanu founder secretary general, Tom Mboya on one side (the first government) and Odinga and Bildad Kaggia of Murang’a in the opposition. 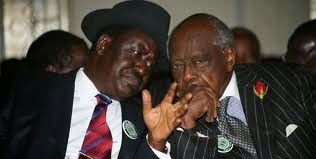 Also intriguing were Kibaki’s remarks, when he, like Raila, spoke before Uhuru. Kibaki told both the president and the former PM: “There is too much quarrelling between ourselves but let us respect the life of Dr Mungai by making Kenya prosperous because fighting among yourselves, you will not achieve much by quarrelling”. Mungai and Kibaki were in different camps during the Kenyatta succession era. These were not random, off-the-cuff remarks made for the moment either. Perceptive observers have started to see that there was more than meets the eye, or ear, at Mungai’s funeral service. The funeral of one of the foremost operatives, who engineered the post-independence, falling-out between the Kikuyu and the Luo that has lasted for more than 50 years was interesting for it happened at a time when a second Odinga is leading the opposition and giving a second Kenyatta who is again at State House sleepless nights. The impression behind-the-scenes of those caucusing between friends and networkers of all three sides, the retired President’s and the incumbent’s and of relatives, friends and strategists of Raila’s is indeed overwhelming. Something is happening somewhere far behind the scenes and it is major. 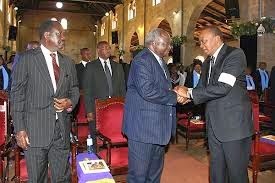 A day later at another venue and occasion, Uhuru again reached out to Raila. This time it was at the official opening of the Huduma Centre in Mombasa. The president for the second time urged Raila to join hands with the government to deliver services. He said party affiliation and religious beliefs should not divide Kenyans adding that if there is a problem, leaders should sit at a round table and dialogue. He told the people of the Coast, a region that voted overwhelmingly for Raila at the March 4 2013 presidential poll, that politics should not cause enmity between them. 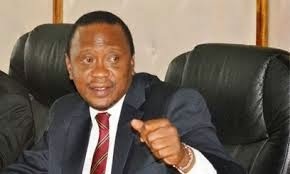 This time, the president spoke explicitly of the Cord referendum campaign, saying “Mimi na Tinga hatuna shida”. I am telling him to continue with his referendum dance while I carry on with my development dance. He can meet the people; tell them his agenda and go back home. 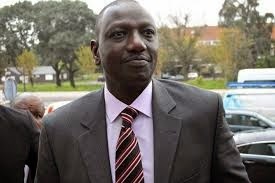 Kenyans have a right to listen to him and make their own independent decision”. However, in a live interview on TV, Raila expressed uncertainty over whether Uhuru’s entreaties could stand the test of time. Raila also addressed another moot issue on TV, a proposed constitutional amendment locking out candidates aged 65 years old and over from joining future presidential races. In his usual fashion of playing to his excitable core constituencies, Raila, who will be 72 in 2017, declared that nothing would shut him out of the race. 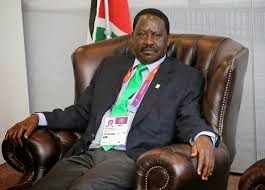 If he is indeed able to vie, Raila will be participating in the fourth presidential race of his political career and the third consecutive one. The president does not want a referendum timed on the midpoint of his first term and Raila very badly wants to gather momentum and traction for 2017, the last great battle of his life whatever happens thereafter. Both men have a lot to gain, the president, a second term that secures his legacy and Raila at least, a first term if he finally wins that crowns his long time desire to occupy the throne. Both men also have everything to lose if they play their cards wrong. Sitting between them is Deputy President William Ruto, a man who for now cannot stand Raila. The sentiment is mutual, because the only way Raila would ever work with Ruto again is if he was not only his senior but also his superior. The impending end of Uhuru’s case at the ICC could bring about dramatic new changes in his demeanour, actions, outreach, networking and partnering. It is being quietly said that a new Uhuru with new priorities could emerge if the prosecution case at The Hague collapses. The most frequent comparison being made is to President Daniel arap Moi after the August 1 1982, coup attempt by disgruntled members of the Kenya Air Force. Raila and his father were deeply involved in that attempt. The coup attempt saw a rejuvenated Moi who dramatically changed his modus operandi. Also watching the scene carefully is DP Ruto, who has his own case at the ICC. If both the Kenyan cases at the ICC involving members of the presidency collapse, dramatic new things could begin happening in Kenya. There are three key prospective scenarios – either Uhuru and Ruto bond even more, politically speaking, after the disappearance of the ICC cases, or the two begin behaving as if The Hague factor was the superglue or waterproof cement that had held them together all along and without it, they will pursue separate agendas for 2017. The third scenario is the president’s case collapsing without, effectively, ever having started, but the DP’s takes more time to resolve, in which case Uhuru begins revising his 2017 options. Political strategists and handlers on all sides and their networks in the corporate and diplomatic sectors are keenly aware of all these metrics and are scrutinising every move. In the matter of Uhuru reaching out to Raila twice in one week, in Kiambu and in Mombasa, it is clear that he is taking the advice of a number of Kikuyu tycoons who believe that the safest way to protect and grow investment in the long run is to defuse political tensions and long-term enmities. Kenya is on the threshold of economic take-off with the continuing discovery of hydrocarbon national resources, the Lapsset project and a growing middle class in all regions. The classic Kenyan political template of Kenyatta versus Odinga and Odinga versus Kenyatta may have suited the country before the prosperity take-off but now it looks increasingly like an impediment not an enabler of the prosperity agenda. Those who are about to graduate from being Kenyan shilling billionaires to achieving trillionaire status do not want the Kenyan national boat rocked by old school political rivalry. 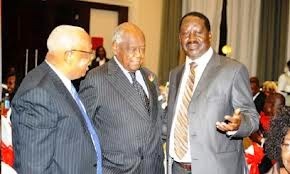 Among the older people pushing Uhuru to find a working formula with Raila without either of them losing face (Kenyatta as incumbent President and Odinga to his highly expectant extended Cord political constituency) is Charles Njonjo, aged 94, but still going strong, and Stanley Githunguri, 74, both of whom did very well for themselves under the late Mzee Jomo Kenyatta and Joe Wanjui, a former chancellor of Nairobi university and a man of means who is also involved. 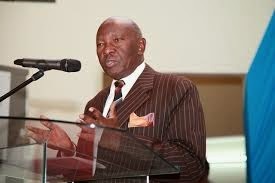 Younger but still substantial Kikuyu tycoons who would like to see the dangerous Kikuyu-Luo divide sealed once and for all and the coming prosperity boom shared in a more enlightened manner than was the case before the discovery of natural resources everywhere include Equity Bank Group managing director James Mwangi and Royal Media Services proprietor SK Macharia. Njonjo and Githunguri have also had banking interests and investments in their long careers. Among the young shakers and movers with an eye fixed firmly on the coming age of a multi-trillion-shilling national budget and countless opportunities in the counties is businessman Jimmy Wanjigi. He moves seamlessly between Raila and Uhuru. In Raila’s innermost inner circle, his elder brother Oburu Odinga, who worked with Uhuru when the latter was minister at the Treasury, is perceived as pushing for a rapprochement with the incumbent president. Raila’s cousin Jakoyo Midiwo is in the game. In parliament, Midiwo was reconciliatory when addressing referendum talks. According to Midiwo, Raila and Kibaki were in agreement during the campaigns for the 2010 referendum that 20pc of the constitution was faulty and that it would be finetuned once it was passed. 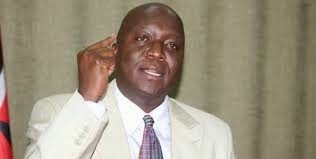 If only MPs could become sober, Midiwo said as he presented one of his most lucid arguments ever in parliament, there would be no need for a referendum as then the amendments could be done on the floor. When Midiwo talks on certain matters, some say, it is Raila’s voice coming out through Midiwo’s mouth. Could it be that it Raila had on this occasion borrowed Midiwo’s mouth? The answer, Kenyans will not have to wait for long. 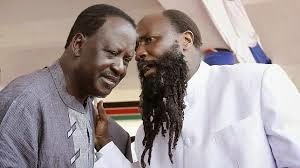 Also being reached out to influence the truce is Raila’s spiritual adviser, self-proclaimed Prophet Edward Owuor. Raila is said to have a lot of respect for the ‘prophet’ who baptised him ahead of his third stab at the presidency. The president’s side would do anything not to be engaged in a referendum scenario where victory is not assured. Raila’s side would do anything to remain relevant, but it is not certain that they can backtrack on the referendum without losing credibility big time and opening the path for a new generation of opposition leaders that would shunt them aside and then fail miserably to deliver the kind of voter numbers that Raila has delivered in two consecutive presidential polls, 2007 and 2013 – almost 10 million combined. 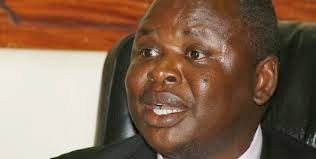 Supporters of Kericho senator Charles Keter have threatened to heckle and boo Bomet county governor Isaac Ruto and Wilfred Lesan instantaneously and directly without respecting them if they dare visit Kericho. This comes hot on the heels of a recent incident in which Senator Keter was heckled and booed by proponents of referendum push by supporters of Cord leader Raila Odinga. They are demanding an unconditional apology from their cousins in Bomet county who jeered the senator at a church function in the county. A former Roads minister who hails from Kericho was quick in calling for tolerance amongst proponents and opponents of the referendum. Senator Keter was heckled when supporters of Deputy President William Ruto and Governor Ruto clashed over calls for a referendum during a fundraiser at Marinyin Catholic Church in Bomet Central. Kericho county is home of the Kipsigis subtribe of the Kalenjin community. The Kipsigis dominate Kericho and Bomet counties but those residing in Kericho are bitter with their brothers and sisters from Bomet following allegations of an uprising of proponents of Cord-led referendum in Bomet county which is a Jubilee strong hold. 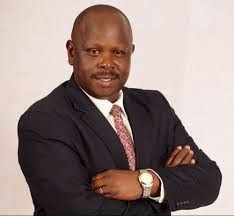 The insurgence which is led by Governor Ruto was played out in the open during the church fundraiser but directed to Senator Keter, an act which residents of Kericho viewed as disrespectful to the electorate from the county who elected Keter to represent them in the senate. At the Kericho press association office on Sunshine Upperhill Motel, Yokozuna Rotich led supporters of the senator drawn from Buret, Ainamoi, Belgut and Kipkelion subcounties in demanding an apology from their cousins from Bomet county, adding that it should be accompanied by a written explanation why their senator was jeered alongside Senator Kipchumba Murkomen. Rotich said that it was disrespective to those who voted for him as their senator and that all residents of Kericho county deserve a written apology with clear vindication and enlightenment as to why they decided to heckle Keter and not Prof Lesan. “We should let our cousins be aware that we will also heckle their governor and the senator Lesan anytime they visit us in Kericho where they frequent and even own property. How can you heckle Keter when Keter is not the president or the deputy? If you have an issue to settle with the central government, face the right persons not our senator!” warned Rotich. Frankline Bett, a former comptroller of State House during President Moi regime and Roads minister in Mwai Kibaki’s regime blamed this on lack of tolerance and disrespect of leaders in opposing camps. “We all have our rights constitutionally to express our feelings or standpoint but it should be in an orderly manner without disrespecting others and looking down upon each other because today’s opposition is tomorrow’s government,” Bett said . The former Cord director of election also said that the ultimatum for more resources in the county should be accompanied with accountability from the counties where money allocated must be seen to have developed and used for the intended projects. Bett said internal auditors are sometimes compromised not to report misuse of funds allocated for development projects in the counties yet it is the same county governors who are asked to account for money already used wrongfully. Bett expressed his disapproval of the heckling of senators in Bomet county and censured leaders whom he revealed were intolerant to each other leading the public to copy from them and confront their leaders during functions. “I will blame leaders themselves who don’t respect each other and as they become examples to mimic by the public who will abuse you just because you are in the opposing camp. Remember in the same measure, you shall receive even in evil,” he rebuked. The former minister called upon the public to act with respect when dealing with matters with political bearing adding that it leads to chaos which would otherwise have been avoided. Belgut West MP Eric Keter led Jubilee supporters in Kericho town to condemn utterances by Kericho governor earlier in the week that leaders in the county supported Cord in its push for the referendum. Keter had accompanied Deputy President Ruto during his tour in Narok and Bomet county. 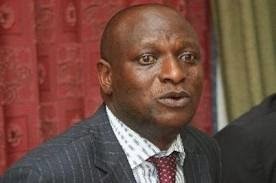 Nevertheless, Keter said that the allegations were ill-timed and misplaced since all MPs in Kericho supported Jubilee initiatives to deliver on the pleas they made during electioneering period. The MP said that Jubilee score board was to provide good roads, water, education and electricity to all families in the country among other promises and that they have little time to spend on referendums which will not only use taxpayers money, but waste on the time they were given by Kenyans to develop and deliver. Keter who was flanked by Alhaj Kiptanui from Interfaith and Cherono Omar, an official from women group in South Rift, denied claims they were rooting for the referendum as alleged by Governor Paul Chepkwony and stating some of those agitating for the referendum were the same people who supported the constitution during the 2005 referendum that it was perfect, order and fit for Kenyans. Omar warned Governor Chepkwony against generalising his utterances as if they were the views of the entire county and advised him to be particular when making personal statements on an issue such as the referendum. “Your governor can’t force you to make any decision about referendum or any other national matter when the constitution is very clear that this will be a personal matter without influence. We are not supporting a referendum and he should be told to stop deciding for us,” she told the governor. The newly created boards across all the counties makes senators chairmen of the county development boards. Already, a similar reaction has been witnessed at Kisumu county where Senator Anyang’ Nyongo’ and a group of MPs from the region were kicked out of a board meeting in Kisumu. Kajwang’, a close confidant of the ODM leader Raila Odinga, has lately come under severe criticism. MPs and party leaders from Western province issued a statement earlier last week citing him and Raila’s elder brother Oburu Oginga, Gem MP Jakoyo Midiwo and Mohammed Junet of Suna East as among those Raila should sideline because they are fond of branding leaders from other regions who are supporting the part as Jubilee moles. A group of party officials from all the eight parliamentary constituencies in Homa Bay county announced that they had ousted Kajwang’ and his entire executive of the county branch where he had been the chairman for a couple of years. They accused the senator of having failed to call the party meeting to iron out a certain pressing problems. Raila, however, insisted that Kajwang’s the ousting was not in line with the party’s regulations. In Homa-Bay politics, Kajwang’ is known to be allied to the Governor Cyprian Awiti who attended the meeting but did not side with the senator. The MCAs declared that they would not allow Kajwang to chair any board meeting in their assembly. A Narok MP allied to The National Alliance party has broken ranks with party boss Uhuru Kenyatta and threatened to lead the Maasai community in supporting referendum being planned by Cord leaders. He said that although the decision has not been fully arrived at, plans were under way for an all inclusive meeting to deliberate on their push for a referendum alongside Cord leaders because the local and central governments have marginalised Maasais from the Purko clan and other community members living in the county. Kenta was speaking after inspecting ongoing roads repairs in Nkareta ward funded by his Narok North CDF. The MP was accompanied CDF chairman Benson Suyadet and community leaders including chiefs. “The majority of the members of the Maasai community from my constituency are asking the leaders to support referendum calls since they have been sidelined in all areas despite huge support they accorded Jubilee through me on TNA ticket,” said Kenta at Nchurra Eshumata Primary School. He explained that it will be unfair for him to oppose the push for referendum while the people he is leading are supporting changes to be done in the constitution which they claim if implemented, will be favourable to them and will see them treated like others in society. The legislator regretted that even the recent ambassadorial appointments by Uhuru did not favour any person from the Maa community. He reminded Uhuru of overwhelming support his Narok North people gave Jubilee coalition and demanded a reciprocate gesture through employment of some of his people to senior positions. “Despite stiff opposition from ODM led by veteran politician William ole Ntimama, the TNA team put up a spirited campaign and saw me cut short the political life of elderly politician Ntimama whom I respect a lot and we are together in the push for our rightful share of the national and county cake,’’ said Kenta as he vowed not to retreat if his case is not addressed with the seriousness it deserves. The MP said it will not take long to see other senior Maasai leaders with similar views emerge when they launch the call for a meeting to discuss and come out with the community common stand on the plebiscite. “We us Maasai community and other non Maa communities living in Narok county will meet and table our problems and that is the reason for us to resolve to support the referendum,” said Kenta. He said he had no apology to make to anybody because it’s a fact most of the Maasais are agitating for parliamentary system of governance as opposed to the current presidential system. Kenta said that illegal settlers in the Mau forest must be evicted because they are destroying the Mau ecosystem through illegal timber harvesting. “The wildlife at the Maasai Mara depends on the waters from the Mau Forest. Destroying these forests means we are destroying our tourism sector. As leaders, we have a duty to stand firm and tell the people the truth,” said Kenta. Kenta joined Ntimama in criticising the Deputy President William Ruto for saying that squatters in Mau Forest will have the cases dealt with in the next two years. IS RAILA A BAD OMEN IN KENYA SOCCER?